Y'all, F&B's new adventures, complete with pictures, are gradually moving over to Formica Fields. They're not very happy with the move, but I thought they deserved their own site. To experience today's adventure, head on over! I'm playing a little game this morning, doing a writing exercise I found online. It's a character development exercise, I'm fleshing out our friend Bessie. You're welcome to help with this, tell me what I've missed, suggest elements of her life and personality which will fit. And if you're new here, Bessie is one of my best buds. You can find her adventures with Fred on the left if you scroll down a bit. Remember, this is interactive! Leave comments! Pet: Flat Moobie isn’t really a pet, but she considers him so, as he requires the care typical of a pet. So there's my little Bess. How can she read a book if she's illerate? Favorite Book? Bessie likes the look of Babe. But she's always been fond of pigs. Bah Ram Ewe... Bah Ram Ewe! Bessie actually likes knowing that Babe can talk to sheep! I absolutely adore the adventures of Fred and Bessie. 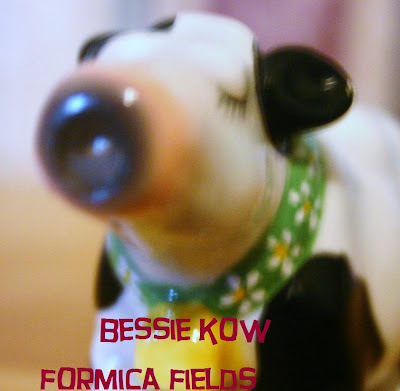 Bessie needs books with pitchures! AG - Good catch with illiteracy. And the whole Babe thing, one of my favorite movies. :) I'll have to find some picture books she loves, like Goodnight Moon or something with cows. A Fly went By, maybe. But more cows. And pigs. Hey, I caught the illiterate thing, too, but because of the super glue, not the books. You know, as in, how did she know what it was if she couldn't read...? This is great, btw! Luvvin' it! Sleeps near the butter. Ha! I am feelin' the bovine love! I mean, I myself LOVE the stuff, but I don't MAKE it...do you see where this is going? Anywho, about The Shack-I have about 10 pages left and I am a little sad that it is coming to an end. It is about a man who has a very close encounter with God. It is so interesting and moving. Gave me a whole new picture of how God loves us! If you ever read it, let me know your thoughts! You are a nut! You make me laugh.